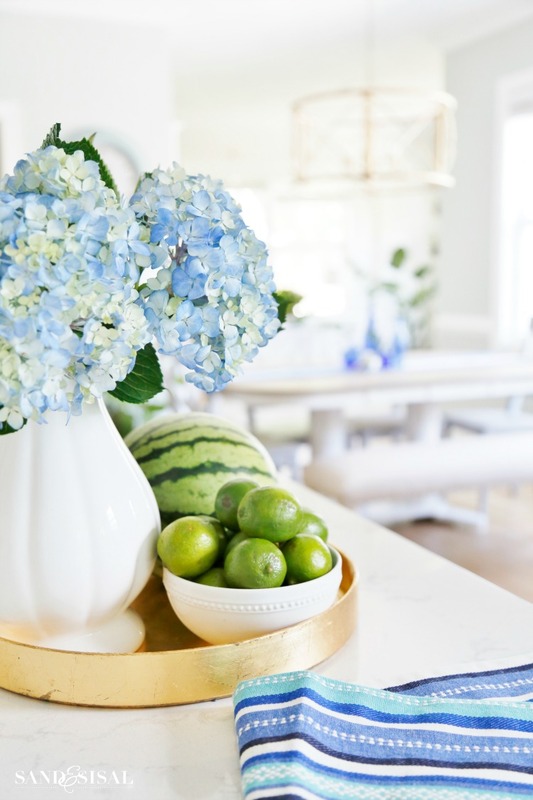 We are celebrating summer in the coastal kitchen! Summer is the one season of the year where the sun pours into the kitchen and to be honest, it makes me giddy with happiness! For this coastal girl, it’s no suprise that summer is my favorite season. We love to grill and serve the family feasts full of fresh veggies, fruits, grilled meats and seafood. With 4 kids (teens), we find our new coastal kitchen is now the main hub of entertainment and we are ready for improptu dinners feeding their friends. Oh my… 16 year old boys eat A LOT! 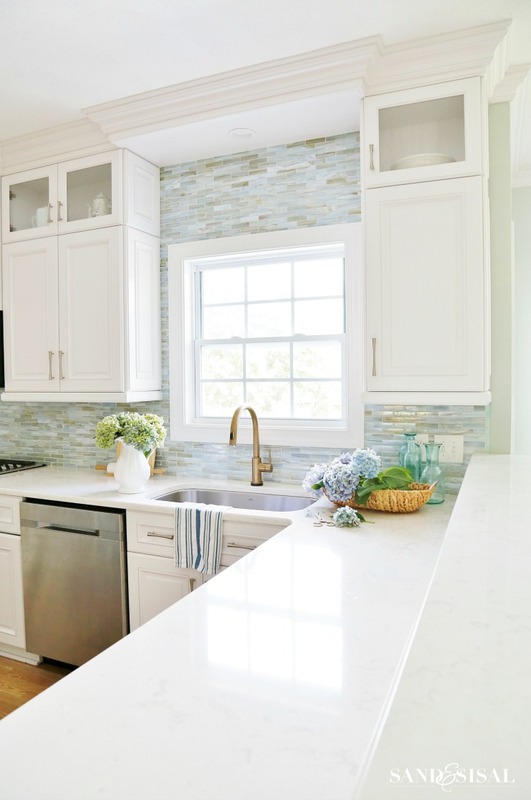 Before I strike up the grill, let me pour you a glass of iced tea or maybe a mojito if you prefer, and come take a peek at our summer coastal kitchen! 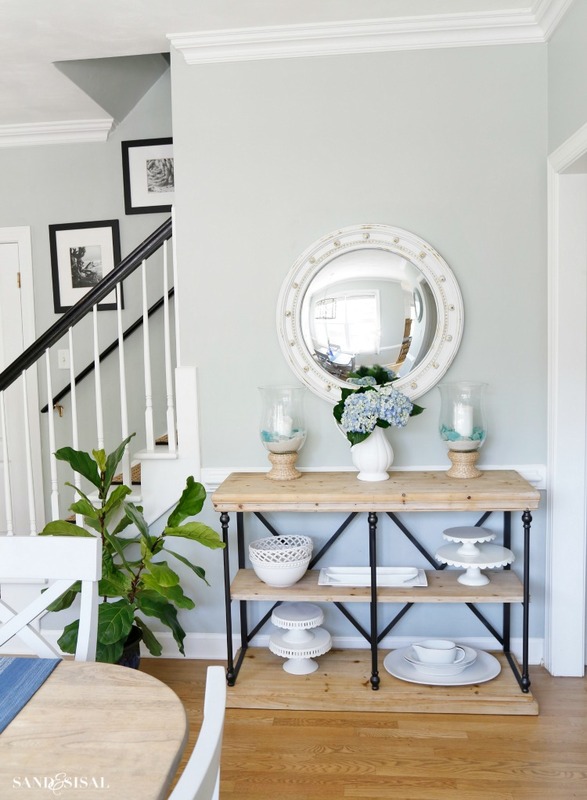 I hope you had a chance to see our Summer Blues Coastal Family Room Tour. 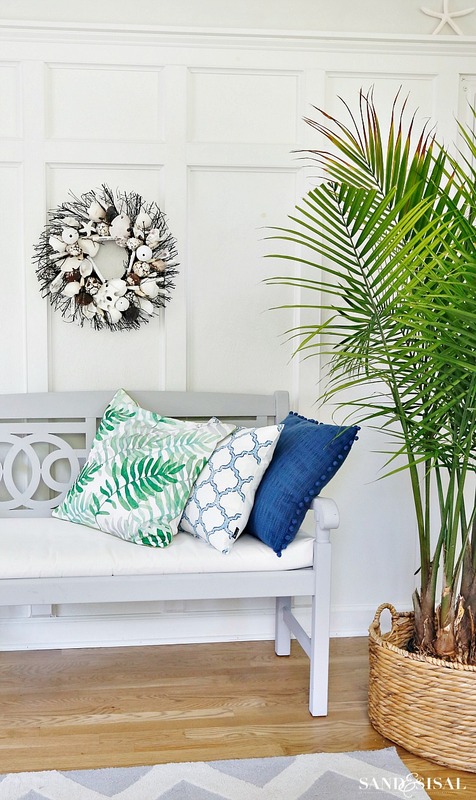 It’s bathed in sea inspired shades of navy, cobalt, seaglass and turquoise, along with plenty of fresh tropical greenery. The theme continues into the kitchen and my office / sunroom. If you follow me on Instagram (which I hope you do. It is where you will find me the most these days), then you probably saw my Instastories where I gave you a tour of my garden and all the different hydrangeas blooming right now. 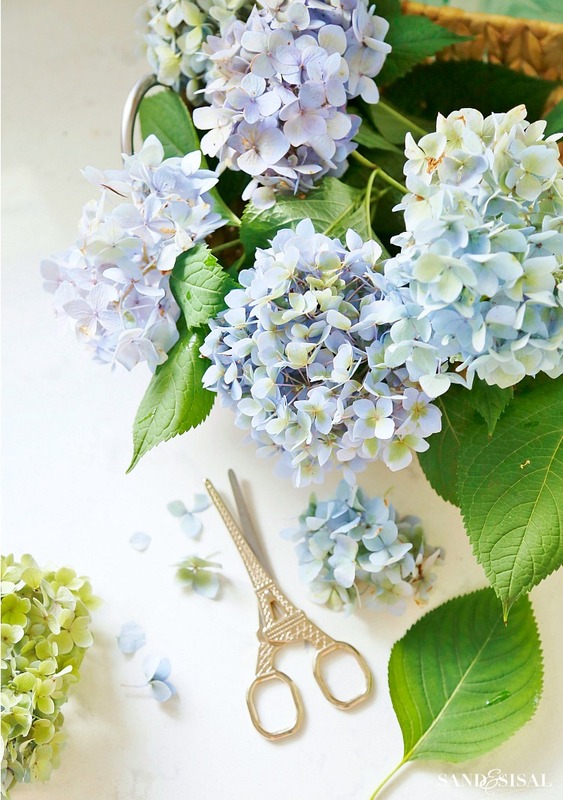 I LOVE cutting hydrangea blooms, making arrangements with them and even drying them. One bush can produce a such kaleidescope of colors. The soft shades of lime green and sea glass – periwinkle blues are crushing on me this week. Isn’t God’s creation mind blowing? The beauty is amazing. Ha! I didn’t even realize until I started editing the photos that my flip flops were in the shot. Ooops! The kitchen has quite a bit of sand on the floor today, hence the flip flops. I promise I’ll swiffer later….. like tomorrow….. hey, it’s summer. 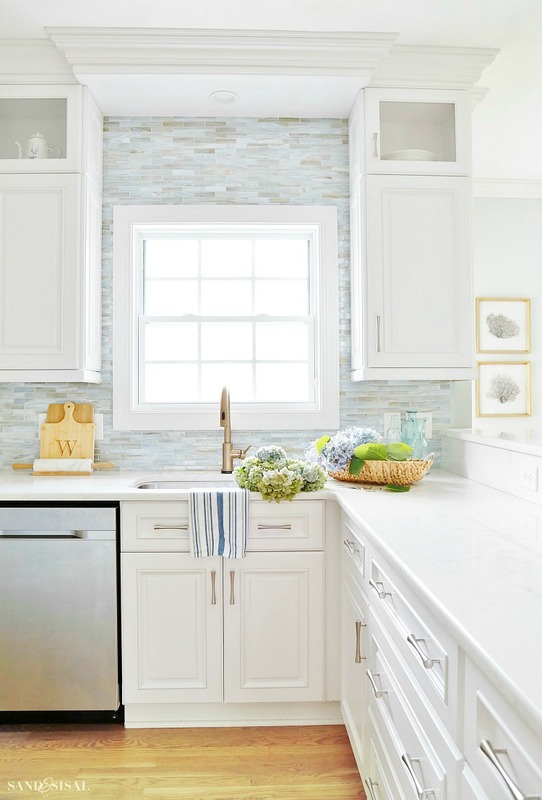 Let’s move into our eating area of the coastal kitchen. Summertime to me says simplicity. Flower arrangements and decor should be straight from the garden or maybe raid your neighbor’s garden! Allow casual coastal elegance to reign supreme. 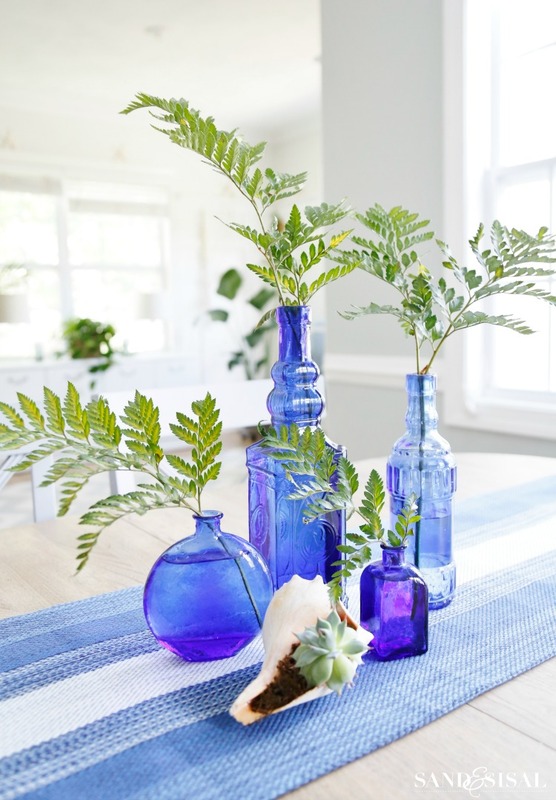 Take single fern stems, or hosta stems, what ever greenery you have and place them in cobalt blue glass bottles for a fuss free, 5 minute centerpiece. My bottles are over 20 years old but I found them at the dollar store. You can also hit up the grocery store florist and ask her for a bunch of greenery like ferns or lemon leaves, which will cost around $3 or less. This easy centerpiece will last for a few weeks. I moved the console table from our foyer into the kitchen and filled it with white cake servers, bowls and our oversized platters. The mirror was previously over the fireplace but I like it in here for now at least. Like always, when decorating, don’t be afraid to shop your house and completely change things around. 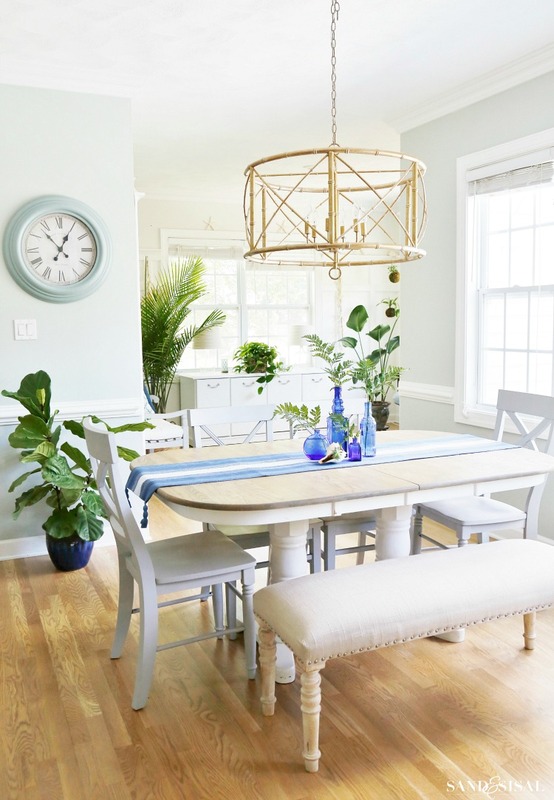 Right next to our summer coastal kitchen is my office aka the sunroom. 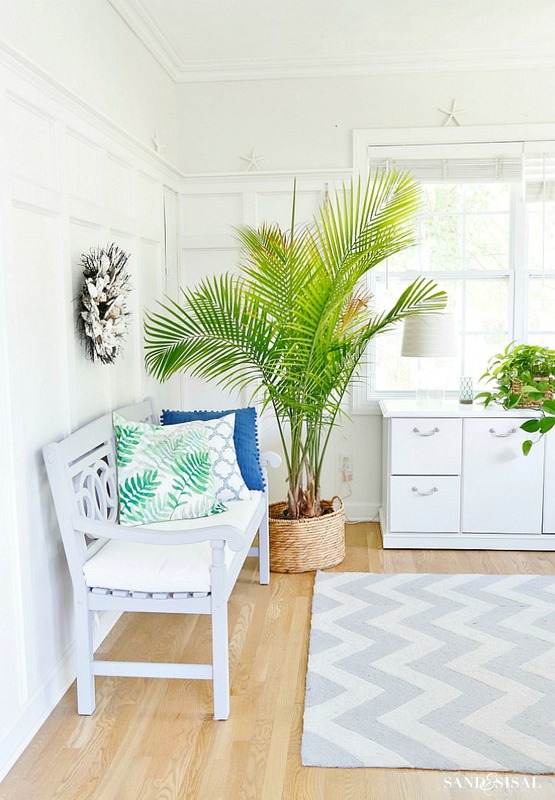 Any sunroom should be filled with tropical house plants right? We have been slowly adding more and more houseplants to help with the air quality in our home. Houseplants are imperative to good quality of air. 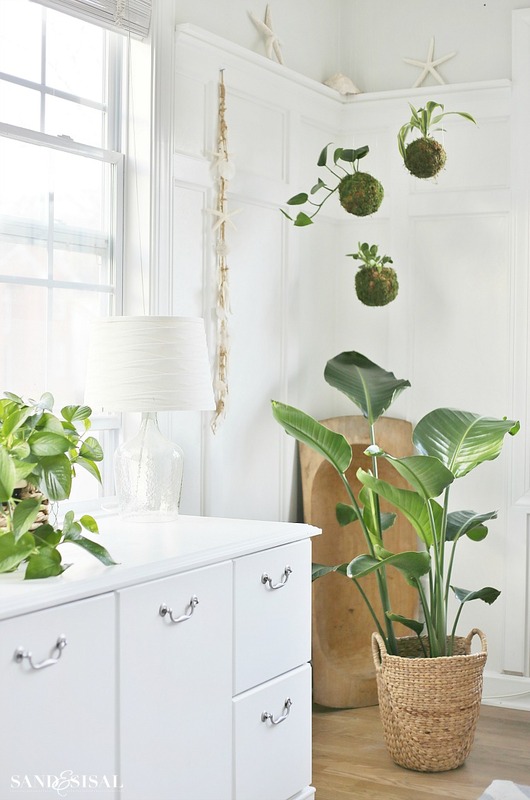 I wrote an article a few years ago that went viral about The 10 BEST Houseplants that Clean Your Home Air…. check it out. Natural beauty with a purpose…. sounds good to me. In case you all were wondering, the kodedama are still going strong! Aren’t they whimsical and fun? I water them once every two weeks. your kitchen looks amazing kim! Kim, I am in the process of remodeling my kitchen. Where did you get the back slash tile? I would like to install in my kitchen. Most tile I have found is too blue. Yours is the perfect subtle balance! The tile is Agate Lucca Pearl in 1×4 brick tile by http://www.lunadabaytile.com/ They are the manufacturer. You can call their customer service number to see who around you carries the tile. Most upscale tile stores will. We love it and I wish my photos could capture how it looks in sunlight because it’s pretty amazing. What the what?? Tell me more about BBQ wrapped in banana leaves. P.s. Everything looks awesome as usual!! Beautiful Beautiful Love the blue hydrangeas! The kitchen faucet is outstanding. Something I would never think of. House is great. I love the color green, but right now that’s the color I have turned because I am so jealous of your kitchen! Gorgeous! You are so talented! Noticed your kitchen sink shape, unusual to me, haven’t seen one like that and your faucet is awesome. Just loved seeing your kitchen and dining area, so, so nice, love it. Enjoy your home, it’s wonderful. We had 3 teenagers at once along with neighborhood of teens who seemed to be at our house a lot growing up. Such a nice bunch of kids. Our oldest son lives close to where we did, is back with all his old friends, is so much happier. He was living in KY for few years so when he got divorced he moved back to San Diego area, does so much with everybody he knew as a kid. They’re all in late 40’s, fifties now. His youngest son lives with him, oldest is in college in KY. Sure do remember what it’s like to feed teenage boys, lol, no bottom to their appetites. Have wonderful week. So fresh, crisp, and pretty! 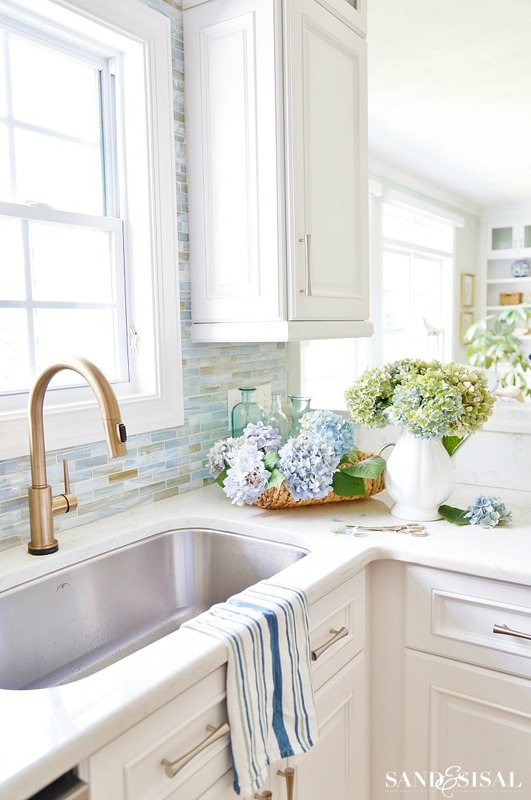 Your kitchen is so beautiful, really inspiring and love the colors! We just planted hydrangeas in our yard! We loved having them at our houses in New York and Hawaii, although they are doing SO much better here in Virginia. Can’t wait until they’re big enough to cut blossoms for decorating. I love the pairing of all that beautiful pale color with the white pitcher and seaglass candles!! And I just LOVE your cabinets! I love the glass-front uppers over the white lowers. We are thinking of doing something like that when we redo our kitchen. Can I ask where you got them? Thank you so much Kristin! Our cabinets were custom made by Dave’s Cabinets in Chesapeake. We love them too! My hydrangeas aren’t producing as many blooms this summer as previous summers because they are under our crepe myrtle trees which are starting to become huge and the hydrangeas really need more sun. But I’m cutting and enjoying each and ever bloom I can! 😉 Good luck with your hydrangeas! They LOVE NOVA! 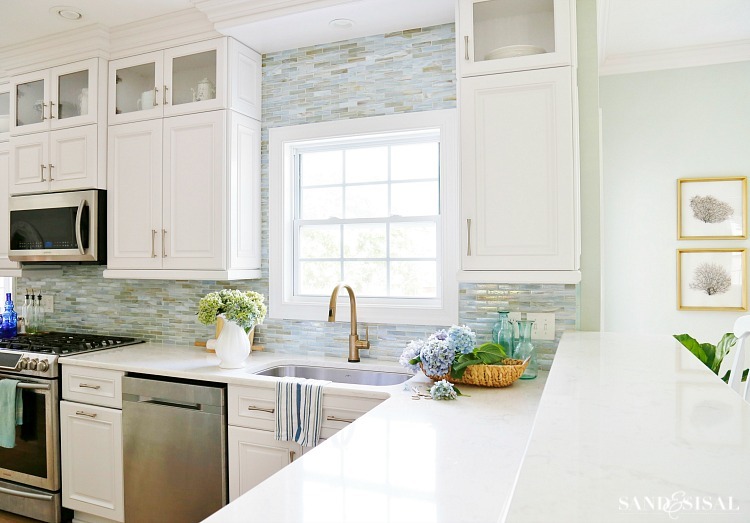 I LOVE your kitchen, and can’t get that backsplash tile out of my mind. Would you mind telling me where you got it? Your kitchen is beautiful! Could you please tell me what your back splash tiles are? They are perfect. We just moved to Williamsburg VA and the house we bought needs updating…especially the kitchen. So that is our first big project. 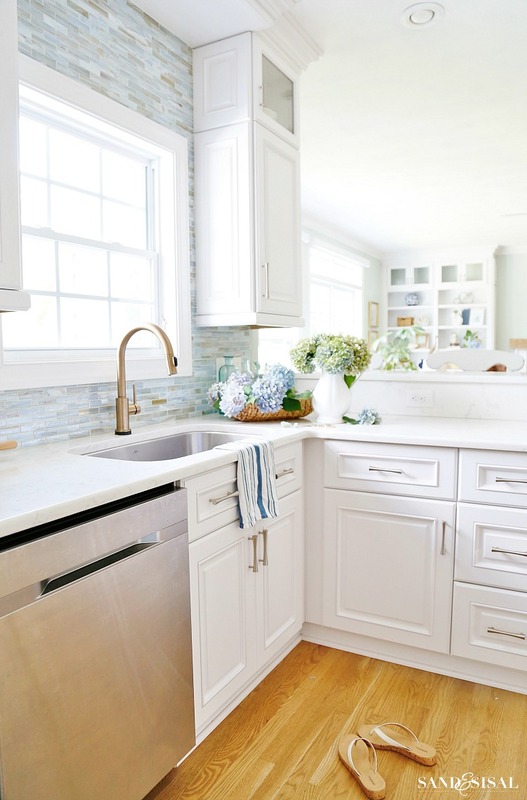 I have been scouring images of coastal kitchens and stumbled on your page. 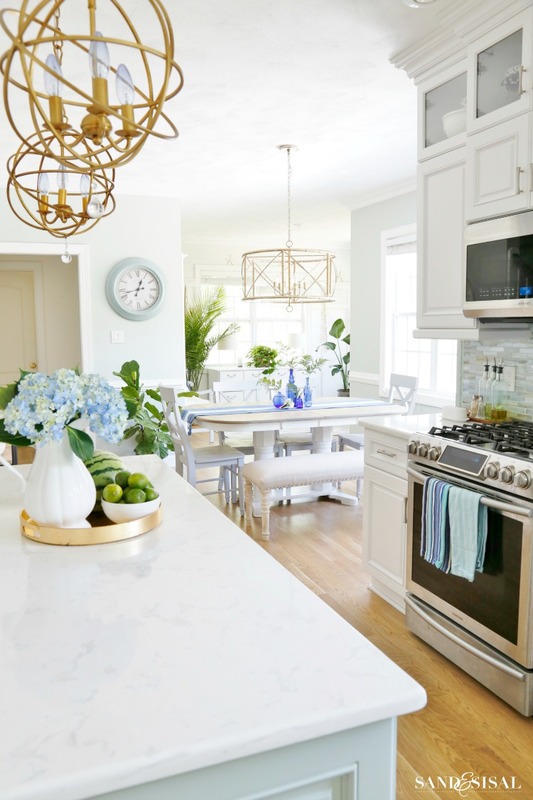 I absolutely LOVE your kitchen…I have literally been studying every detail in every picture trying to figure out how much of it I could re-create in our kitchen design. I see that you shared the backsplash tile (thank you) as well as the cabinet manufacturer. Any chance you can share the paint color on the wall. Also, are the counter tops Quartz? I wish you could just come remodel my house (while I disappear to a month)…. Thank you Debbie! We are loving the new kitchen! The counters are Cambria Quartz in Torquay. 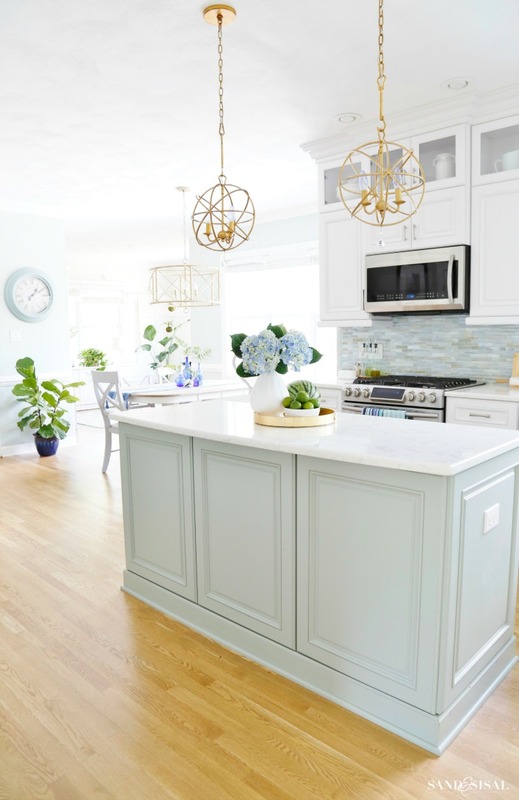 The walls in the kitchen area are painted in Comfort Gray and the the walls in the adjoining family room are Sea Salt (both by Sherwin Williams). 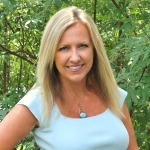 Have a beautiful week and congrats on your move to Williamsburg! Beautiful Kitchen, Mine is looking very similar! Could you tell me where you got your cabinet hardware? Hi Ashley! Thank you so much! The hardware is Sedona Elements and they were provided through our custom cabinet maker. Thanks CJ! The color is Oyster Bay by Sherwin Williams. Thanks so much! 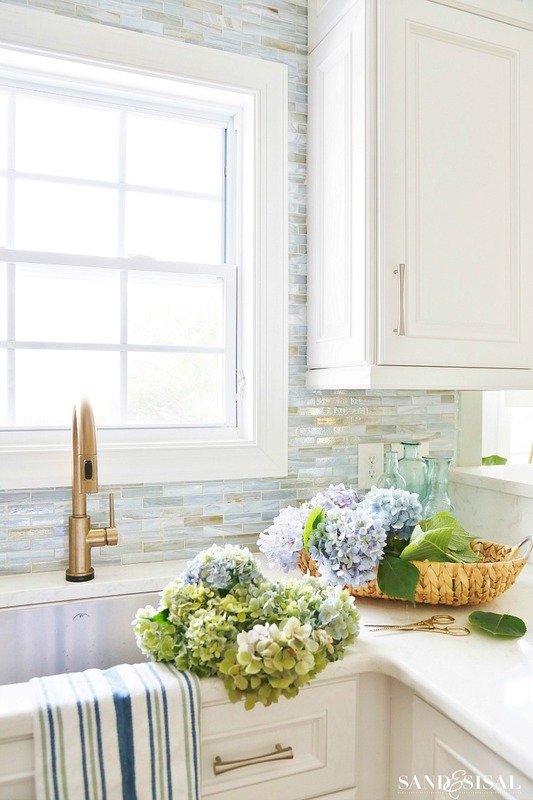 Love the back splash in your kitchen. Where and what’s it called. We recently moved and as I told you before I’m changing over from antique farm to coastal. The cabinets are oakish and petty good shape but I really wanted white to brighten it up. Any suggestions on how to do this. I would like it professionally done. Love the bright cheery feeling in your rooms-and as I read, I see that you used Ivoire as well from SW-I have it EVERYWHERE in our home! But the reason I reach out to you is my floors-we are in the process of deciding what to do. We have have carpet upstairs, brazilian cherry hardwood in our foyer (northern exposure) tile in the kitchen and two types of laminate in different rooms! I know I know. I need to make up my mind! First though, I would like to keep the tile in my kitchen, for now. and have the same hardwood throughout the first floor. I am not blessed with the natural light you have. We live in DE, and my lovely suburban home is facing north. I love your floors because they are light, but not too light. I know it is a oak hardwood, but how did you get that wonderful color? Also, I really used to love the brazilian cherry in my foyer, but now feel it is too dark and wouldn’t match with what I want to do in the rest of the house. Should I keep the floors in the foyer, and do them in the rest of the downstairs, or rip all out and start over? I have been searching your posts (been reading them for quite a few years now! ), but cant find the color for the floors. Forgive the blatant copying, but I love everything you have done! Studying the blog from the beginning to re-inspire my own efforts! Hi Debbie! Thank you so much!!!! You are just the sweetest and made my day!! !The floors are white oak and we had them re-finished with 2 coats of Weathered Oak stain by Duraseal. If you plan on adding wood the rest of the downstairs then I’d rip out the cherry. There are so many pre-finished flooring options available today which is easier to install. We had to move out to have the floors re-finished. No fun!